Carrying a baby inside you changes your center of gravity and puts a lot of stress on your back, neck, abdominal muscles, and shoulders. Pregnancy also relaxes your ligaments, so that your pelvic joints are less stable, and changes your posture, pulling your pelvis forward. Add to that the extra weight you're carrying and you may find you've got an aching lower back! Prenatal massage shares many of the goals of regular massage - to relax tense muscles, ease sore spots, improve circulation and mobility, and just make you feel good. But it's also tailored specifically to the needs of pregnant women and their changing bodies, and therapists who are trained in prenatal massage adjust their techniques accordingly. You can't lie face-down on a traditional massage table once your belly has started to grow, that's why we have a special table just for pregnant women! Our table has a hollowed out hole for your belly so you remain comfortable during your massage and can still experience a massage just as if you weren't pregnant. 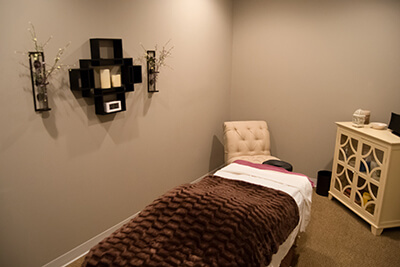 We also have a normal massage table if you prefer your massage while laying on your side.